The Blairites and the Israel lobby must be getting the jitters about Mike and his forthcoming hearing to clear his name in the Labour party. And it looks like they’re absolutely terrified that he’ll get the money he needs to sue the newspapers and individuals that started the smears for libel. So they’ve decided to smear him again. In a piece he put up on Thursday, Mike explains how he was told by a friend through email that a bunch of clowns calling themselves JVLWatch were on twitter. They were targeting those, who had contributed to his crowdfunding campaign to raise money for his libel case by misrepresenting a strip Mike created and wrote for his small press comic, Violent. Violent was Mike’s tribute to Action, the 1970s comic that drew outrage for its violent, gory content and ended up being banned. 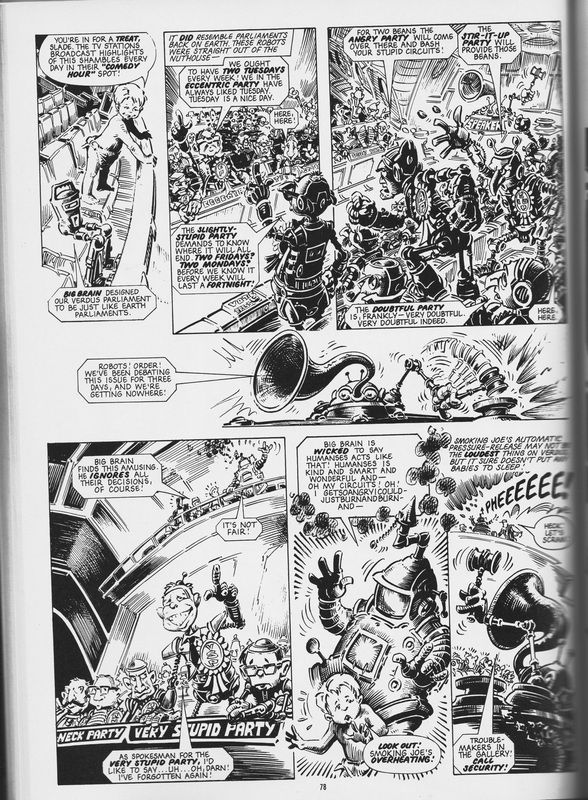 Its creators then went on to produce the mighty 2000AD. The strip JVLWatch cited as proof that Mike’s a Nazi is his satirical strip, ‘Hardboiled Hitler’. In this strip, Der Fuehrer is given superpowers similar to those of captain America. But while Cap’s powers are acquired decently, Hitler instead steals the syringe containing the supersoldier serum, and injects it into himself in a disgusting toilet. —Extreme flatulence: According to JVLWatch, this is a sign that Hitler is being portrayed as a superhero. How many superheroes do YOU know who have the farts? Well, there is one: Mr. Methane, a man who turns up in superhero costume and makes his living breaking wind in supposedly funny and amusing ways. Like the original Le Petomane in 19th century France, who could fart the tune of the Marseillaise, ending with the fall of the Bastille. But he’s the only one. For further information, go see Mike’s blog, where you can read the defence he gave to IPSO, and a story from the strip to show this mocks Hitler as a clumsy, posturing clown. Now I’ve some interest in the ‘Hardboiled Hitler’ strip, because I studied the rise of Fascist and Communist regimes as part of my history degree at College in the 1980s. Mike asked me for bits of historical information about Hitler and his squalid, murderous band. And I confirm that Mike’s intention was always to satirise and humiliate the Nazi leader. He very definitely had no intention whatsoever of making him appear glamorous, or glorifying the Nazi regime. And the literary style Mike is using to satirise Hitler is called ‘mock heroic’. It’s been used in British literature since at least the 18th century. In it, you give the objects of your ire a heroic treatment in order to show up their failings and paltry character. Which Mike has done here admirably. I can also remember talking to Mike about the serious issues of the Nazi regime. At that stage, I don’t think Mike had any firm ideas regarding the story, but he was determined that if it did cover issues like the Death Camps, these would be presented absolutely straight. They would be written as grim as possible, with every sympathy going to the Nazis’ victims. Because the systematic slaughter of innocents, Jews, Blacks, or anyone else, is never, ever a laughing matter. He made it very clear to me that if he did show that aspect of the Nazi regime, it would be to shock readers with the terrible reality, to make the point that Nazism, although a suitable subject for satire and comedy, was also absolutely horrific. To make the point that the Nazis deserve to be sneered and laughed at, but the danger they represent should never be underestimated. I should also point out here that the British comics milieu, as it is now, is very definitely not racist. Certainly not the parts I’ve seen. Mike and I grew up reading Marvel Comics, enjoying the creations of Stan ‘the Man’ Lee, ‘Jolly’ Jack Kirby and others. The American comics industry was the creation of American Jews, as shown in the book about the origins of the superhero strip, Men of Tomorrow. The creators of Superman, for example, Jerry Siegel and Joe Shuster, were both Jewish. As is Stan, and Jack Kirby. The Jewish background of Superman’s creators may explain why the Nazis hated the Man of Steel. They attacked him as a Jewish plot to destroy Aryan culture. The last thing Hitler wanted was a guy with superpowers, devised by two Jewish blokes, flying around defending Truth, Justice and the American Way, and particularly not Democracy. If you want to see something of the background in which many of the creators of the American comics industry grew up, try Will Eisner’s A Contract with God and Other Tenement Tales. American comics often explicitly dealt with racism and prejudice. In one episode of the Superman radio series, the Man of Tomorrow went into action against the Klan. The episode was praised by civil rights and Jewish groups, including the NAACP – National Association for the Advancement of Coloured People. In the 1970s both DC and Marvel characters went out, exploring the contemporary racial issues around them. New, Black characters were created. In Marvel, these were the Falcon, Brother Voodoo, Powerman, alias Luke Cage, hero for hire, and the X-Men’s Storm. In fact the X-Men can be read as a reflection of the position of racial and sexual minorities in America. They’re a persecuted underground of people, set apart from normal society, like people from ethnic minorities and gays. And these stories would deal explicitly with the horrors the Nazis perpetrated against the Jews, and would still like to do. I can remember reading one comic, in which the transhuman Nazi villains Armin Zola and his buddies were trying to create the Cosmic Cube. This was an object that gave its possessor godlike powers over the entire cosmos. They were using humans, wired up into a computer, to perform the calculations needed to create the artifact. However, the calculations were so difficult, they burned out the brains of the unwilling human components, leaving them mindless, drooling idiots. And so the people they were using in this grotesque experiment were Jews. The strip featured the attempts of the story’s heroine to save to her lover, Yusuf Tov, from this fate. And tragically, she’s unsuccessful. I’m very much aware that this is a science fictional treatment of the Nazis, and that objects like the Cosmic Cube don’t exist. And Nazis themselves don’t look like Arnim Zola, who had upgraded himself through high technology so that he was now a TV with arms, legs and an aerial where his head should be. But it made the point that the Nazis had absolute contempt for human life, and regarded Jews as worthy only of exploitation and murder. And on this side of the Atlantic, there was Pat Mills and the recidivists of 2000AD, the Galaxy’s Greatest Comic. Many of the strips there had a very definite anti-racist content. ‘Strontium Dog’ was set in a future Britain devastated by nuclear war. The Strontium Dogs of the title were mutant bounty hunters, named after Strontium 90, one of the products of nuclear fallout. These were deformed men and women, who were forced to live in ghettos. By law, bounty hunting was the only job they could do. And when they travelled anywhere around the galaxy, it was very definitely in steerage. The strip’s hero was Johnny Alpha, his norm partner Wulf, and their alien friend, the Gronk. One story in the 1980s was about the attempts by Nelson Bunker Kreelman, Alpha’s father, to exterminate Britain’s mutants while trying to hide the fact that his son was one of them. It’s definitely not hard to see that the strip was an anti-racist metaphor. As was ‘Nemesis the Warlock’, set in a far future where Earth was under the control of the Terminators, a Klan-like outfit led by their Grandmaster, Tomas de Torquemada. They were a pseudo-religious order, who had led humanity into a new Dark Age, and were rabidly against all forms of alien life. Their leader took his name from his own hero, the head of the Spanish Inquisition in the 15th century. Mike was given considerable assistance with Violent by many professional comics writers and artists, many of whom have worked for the mighty 2000AD. They’re great people, immensely talented, and if they had thought for a single minute that Mike’s strip was a genuine glorification of the Nazis, they wouldn’t have touched it or him with a bargepole. As for the group which made these despicable allegations, their name reveals what they’re really terrified of: left-wing, Israel-critical Jews, and Jewish Corbyn supporters. Like Jewish Voice for Labour. And here we get into real racism and anti-Semitism. As I’ve also blogged about ad nauseam, the Israel lobby hate with a venomous passion self-respecting Torah-observant and secular Jews, who criticize Israel and support Corbyn. Because they give the lie to their propaganda that Zionism, Israel and Jewry are identical. And so they do everything they can to smear them as self-hating, anti-Semitic and use foul language against them, including wishing that they had died in the Holocaust. Tony Greenstein has made the point that Zionism is a Jewish form of anti-Semitism, because it holds that gentiles and Jews are fundamentally incompatible and that gentiles will always hate Jews. Hence their contempt for diaspora Jews, who wish to remain in their parents’ homelands, and who regard Israel with contempt for its colonialist maltreatment of the indigenous Arabs. It is not Mike and his fellow comics professionals who are at fault here. It is the shabby people of JVLWatch, who had behind internet anonymity to smear and revile decent, anti-racist people and their campaign for a better, more inclusive, tolerant Britain. More satire aimed very squarely at the Tories. This little piece was put up on YouTube by Dutch Wogan. It’s a send-up of Mastermind, in which May responds to every awkward question about the failures of her own party and their policies by blaming the last Labour government. Just as May has been doing herself in reality recently. In fact, the Tory tactic of blaming everything on Labour, no matter how long ago Labour were previously in power, or how far-fetched their explanation for Labour’s responsibility is, has become something of a cliché itself. Way back in the 1990s – I think it was that long ago – Harry Enfield did a short piece about the answer you’d get from a Tory politician if you simply asked him for the time. Okay, so it’s not quite the standard answer of blaming the last Labour government, but it’s close, and shows just how tired and hackneyed their responses and knee-jerk attacks on Labour to divert attention away from their own, glaringly manifest failures are. May and the Tories, as Mike’s pointed out, have had seven years to sort out the country’s problems and cut the deficit. They haven’t, because fundamentally they don’t want to. They want to continue squeezing ordinary working people, privatising the Health Service and destroying what’s left of the welfare state, all under the pretext of tackling the deficit. Which in fact is just a cover for policies designed to enrich the bloated and exploitative 1 per cent even more. It’s high time these clichés and the people, who mouth them, were stopped, and a proper Labour government returned to power. This is another song attacking the Tories, like last years – or the year before that’s – ‘Liar, Liar’. This time its by a group called the Iain Duncan Smiths, and it tears into him and Universal Credit. Singing as him, they say they want Universal Credit rolled out across all constituencies, and for people to pay for the phone calls to take out an advance loan. They also state that they want to keep you waiting for longer than six weeks. That’s a month without money. They also have him telling people to shut up and be positive about Brexit. While on his own personal source of wealth, the Gentleman Ranks intones ‘Affluence, man, I wed it!’ Yes, he’s another Tory waster, who’s got a rich wife or partner.